I quite like how this card is designed, although I do think it’s a little curious that we’re kind of back to the “here come cards that hose the previous block/set” school of design. I suppose it’s not quite as bad as Rest in Peace appearing in the set right after Innistrad. And as those kinds of hosers go, Price of Fame is actually pretty fair. It’s the sort of card you’d be looking at anyway, as there are always decks that can afford to have at least some of their answers come down later when they also help with card selection. 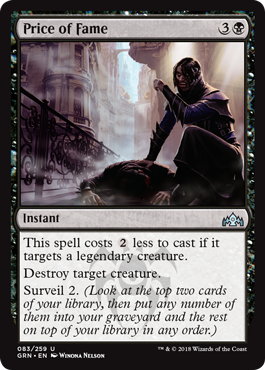 It’s also not the sort of thing that is going to feel a lot less useful when a current set – Dominaria and its historic spells theme in this case – is out of Standard, as we’re likely to be getting new targets for as long as they design for Commander and Brawl. While Price of Fame is pricey in general (particularly compared to Cast Down, Standard’s removal spell of choice), the surveil triggers are a solid upside for a deck who wants to maximize the use of the effect, and it also doesn’t miss legendary creatures like Cast Down does…in particular, it gets an upside there. Add in the instant-speed, and you have a winner. I don’t think most decks will want to run the full four, but having some on-hand to set up your draws and dispose of threatening legendary creatures (like the new Aurelia, to name one) is a win-win in my book.